Redpark Gigabit Ethernet Adapters are the first to connect iPad and iPhone to high-speed Gigabit Ethernet using Apple's Lightning connector for iOS devices. Ideal for field technicians, kiosks, and point-of-sale (POS), users can connect to Ethernet while charging the device either from an AC power source or Power over Ethernet (PoE). Customers who use iPad point of sale systems, wish to connect iPad to a company’s internal secure network, use iPad in education, or need to get online in poor wireless environments can use these adapters to connect iPad to ethernet. Redpark Product Development announced today that it is now shipping the first adapters that connect iPad to gigabit ethernet, the Gigabit + PoE Adapter and Gigabit + Power Adapter. These adapters allow iPad customers to connect to ethernet while simultaneously charging the device. 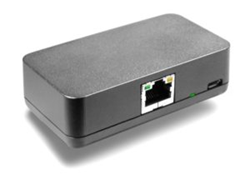 — The Gigabit + PoE Adapter(shown above) connects iPad to ethernet and uses power over ethernet (PoE) to charge the device via a single ethernet cable when connected to a PoE-capable Ethernet switch or PoE injector. It is a PoE (802.3af) Class 0 device, has an MSRP of $99 and is available today at http://www.redpark.com. The part # is L6-NETPOE and the Gigabit + Power Adapter part # is L6-NETAC.